Individuals should ensure that their wills are properly drawn up so that their estates are distributed according to their wishes. If they do not do so, the administration of their estates could be tricky affairs or long uphill battles. According to lawyers, the most common pitfall when it comes to drafting a will is producing one that lacks clarity. Farah Deba Mohamed Sofian, chair of The Society of Trust and Estate Practitioners Malaysia, says many testators draft their own wills according to what they see in the movies, which can be oversimplified. “That is nonsensical. You need to make sure that the will can be implemented and administered smoothly without incurring additional costs or confusion. If your will causes disputes, then the executor does not have a choice but to go to court to get clarity [on how to administer the estate],” she adds. Wai Chong Khuan, a partner at legal firm Low & Partners, cites a case where a testator intended to let his son inherit his house. Although he made this clear in his will, he did not address how the contents of the house were to be distributed. “The house may have expensive antiques and furniture or valuable paintings, carpets and tapestries. Do these items go with the house or do they form part of the residuary estate?” says Wai. Residuary estate comprises the remainder of one’s assets after all costs (such as taxes) have been paid, gifts and bequests have been made and all claims of the estate have been satisfied. A residuary clause is a provision in a will that disposes of assets that is often overlooked by those who write their own wills. “It is imperative that every will has a residuary clause. 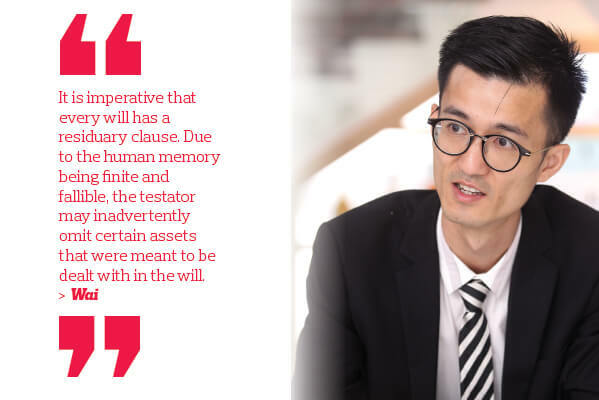 Due to the human memory being finite and fallible, the testator may inadvertently omit certain assets that were meant to be dealt with in the will,” says Wai. Farah emphasises the importance of the “the catch-all residuary clause”, without which the testator risks dying intestate (dying without a will). “This means your family will have to go to court to empower someone to be an administrator so that he or she can deal with the residual assets,” she says. This process, having to list the remaining assets as part of the estate, is an arduous one. According to Farah, when an estate is only partially administered by a will, the family has to apply to the court again and this process requires the administrator to put up a bond as security. “The bond must be equivalent in value to the estate. It is meant as a security deposited with the court for the period of administration. In addition, intestacy means that you must get all your beneficiaries to sign all the documents and agree to everything, including the distribution,” she elaborates. It is common for people who are in long-term relationships to appoint their spouse, eldest child or a family member who knows a lot about them. Farah suggests ensuring that the executor is efficient enough to administer the estate. “If your wife has been a housewife all this while, then I would advise appointing your eldest child or a sibling,” she adds. Appointing only one executor is also a mistake as he or she may not be able to administer the estate due to various reasons such as illnesses, migration and death, says Farah, who recommends having a clause appointing substituted executors (in addition to the original one) during the estate administration period. She points out that it is a requirement of the law that where it involves minors (below 18 years old), you need two executors. “You should have substituted executors named because if you die while your children are still young, you are looking at 10 to 15 years of administrating the children’s assets, or until they turn 18. The exception, however, is if you choose to appoint a corporate trustee. Then, you do not need more than one. But it is still advisable to appoint a substituted executor,” she says. It is also practical for testators to inform the people they choose to appoint as executors before declaring it in the will. “You are going to give them a huge job. So, you must inform them so that they do not turn it down later,” says Farah. Wai points out that testators tend to appoint their sons or daughters to execute their wills as they are the safest choices, not taking into consideration that they may still be minors when the will needs to be executed. “They forget that executors must be at least 21 to carry out their tasks,” he says. Testators also tend to leave out a clause that grants power of sale to executors. This mistake could complicate the process of distributing property assets, says Wai. “In almost 80% of the cases, beneficiaries would refuse an asset such as a house as they already have their own house and prefer to sell the asset instead. Also, executors must have enough cash to execute the estate. Farah cites a case where a man appointed his wife to be the executor of his estate. The problem was that she was not well versed in handling finances, much less estate administration. “There was not enough cash in her name. So, her late husband’s estate could not be administered and was frozen. Had he gone to see a lawyer [when drafting his will], he would have been advised to leave some cash in her hands,” she explains. Failing to provide for the scenario where the beneficiary dies during the lifetime of the testator is a common will-writing mistake, according to Wai. He says confusion over the devise or bequest would arise. Will it go to the estate of the beneficiary or form part of the residuary estate? “In general, where the beneficiary dies in the testator’s lifetime, the bequest or devise will lapse and will form part of the residuary estate. However, if the deceased beneficiary has children, then the devise or bequest will go to the beneficiary’s estate,” says Wai. If a beneficiary is below the age of 18, he advises parents to appoint a person to be the child’s guardian after their death. By doing so, the interests and well-being of their child will be safeguarded without the need to go through a lengthy court process to obtain guardianship. Wai points out that some testators assume that their Employees Provident Fund (EPF) nominations can be made or amended by way of their will. This is not the case as it must be done at the EPF itself. “Any nomination should be made in a prescribed form at the EPF office. If a revocation of a beneficiary nomination is required, it should be made in the proper form provided by the EPF and not by way of a will,” he says. The same goes for life insurance nominations. Wai says both the nomination and revocation must be done properly with the insurance company, not by using a will. “If the nominee is a spouse or child of the policyholder, then the policy money payable upon the death of the policy owner should go to his or her parents. If the nominee is neither the spouse, child nor parent of the policyholder, then he or she will receive the policy money as an executor,” he adds. Farah says another usual mistake when writing a will is choosing beneficiaries as witnesses. This usually occurs when people write their own wills after obtaining a template off the internet. “For these simple wills, the testators would usually get their children or children-in-law to witness, for example. This is wrong because it disqualifies them from being beneficiaries,” she says. The bottom line is that it is important for anyone who wants to write a will to consult someone who has knowledge in will writing. This could be lawyers or people who represent themselves as will writers as they would be well versed in estate planning, says Farah. She adds that many believe that all they need to do is download a will template off the internet, fill in the blanks and be done with it — without realising that a lot of laws are involved. This can undermine the intricacies of estate planning, especially when one has several types of assets in different regions or countries. “The No 1 mistake, in my opinion, is not to consult someone who has knowledge in will writing and the laws of inheritance and succession because inheritance is going to get more complicated because of the tax issues — for example, stamp duty, sales tax and Real Property Gains Tax,” says Farah.